Mildly alkaline cleaner for removing rust stains and residues of metal oxide. The reactive compounds work on the rust and transform it into water soluble particles. The reaction becomes visible through a purple discolouration. The resulting particles can be rinsed off with water. 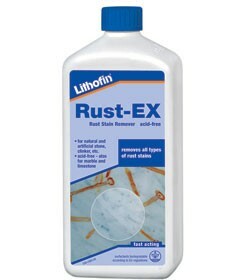 Lithofin Rust-EX does not change the appearance of the surface and can therefore be used on single stains and localised areas. Cleaning Internal Natural Stone Cleaning patio's and external natural stone Cleaning Ceramic, Quarry and Porcelain Tiles Problem Solving On Patio's and External Natural Stone Problem solving on external, cement based materials, patios, concrete flagstones, driveways Cleaning external paviours, block driveways and patio slabs.